"The history of Serbia's involvement in World War One can basically be split into two phases. In the first, following the first attempted invasion by Austria-Hungary, the Serb Army successfully defended its country against several invasions until overwhelmed in the autumn of 1915 and deciding on a long and terrible retreat through Albania, from where it was evacuated to Corfu. After recovering and reequipping on Corfu, in July 1916 the Serb Army moved to the Salonika front, where it served for the remainder of the war, eventually liberating most of Serbia from the Central Powers before the armistice. Such success, particularly for a smaller nation against much larger powers, inspired much admiration from her allies, but apart from a truly terrible set from HaT this is the first time Serbia's armed forces have been properly depicted in this hobby. The most distinctive feature of the Serb uniform in 1914 was the cap with the indentation running front to back, which most of the figures in this set are wearing. For the soldiers this has no peak, but the officer's version does have a peak, which is fine. The rest of the uniform is obscured underneath the greatcoat, which is a calf-length double-breasted style with two thigh pockets, which matches well with the standard M1908 greatcoat worn by front line troops at the time. After the army was refitted in Corfu they were supplied with French and some British uniforms, and the greatcoat modelled here could also be the French garment. Underneath the coat the legs show that some have ordinary puttees and short boots while others wear the traditional Serb opanci footwear; the latter being less likely in first line troops, though perhaps not inconceivable. Finally, three men wear a helmet of the French Adrian design, which helps with our consideration of the dating of this set below. All the men have a pair of ammunition pouches on the front of the waist belt, and none at the back. They have a haversack on one side or the other, and a water bottle high under the arm on the left side. Quite apart from the impractical positioning, the circular design matches no Serbian or French version of this item, nor that of any other belligerent in the war, so is a mistake. The bayonet scabbard on the left hip completes the kit roundup, since none of the men have a pack or other impedimenta…." 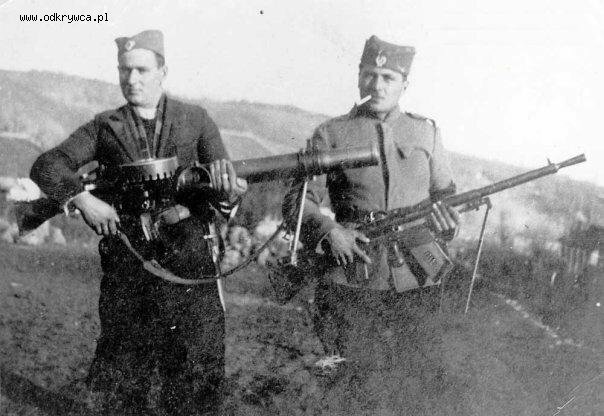 The issue with the Lewis gun can be resolved by using that dude for the Kingdom of Yugoslavia Army. On the Lewis gun Wiki entry they are listed as purchasers of the Lewis. Most of the figures are good for 1941, and likely Axis forces that still used old Yugoslav uniforms during the anti-partisan war. I had emailed the PSR editor with that, basically got back "but that's not what the box says". Valid, but the figure is still useful. That picture is one of a Facist Unit in Yugoslavia in World War Two using German issued Dutch Chauchats and English or Belgian Lewis guns. Out of period, but a cool picture.